Preferred for nymphing and great for large streamers. 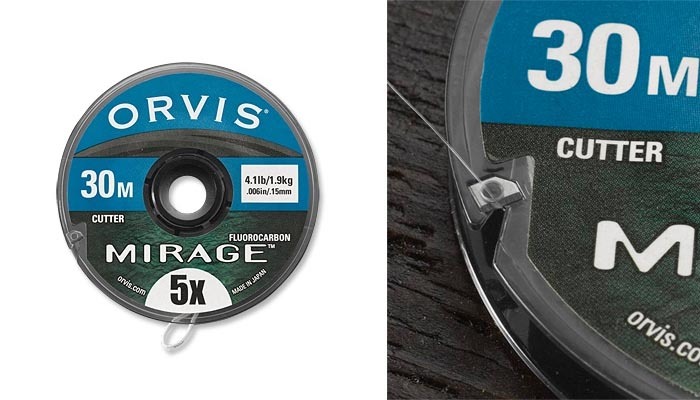 Outstanding turnover power, the result of patented extrusion taper technology-an Orvis exclusive. Fly fishing tippet has line retainer on each spool. Mirage is not another nylon tippet material. Mirage is made from an extremely high-grade quality of PVDF (polyvinylidenfluoride). It is less visible in the water, absorbs less water, and has higher wet knot strength than comparable nylon. It is significantly more abrasion-resistant than nylon. Free. 30% more tippet material than any competitive tippet! Ideal for all Saltwater fishing, plus steelhead and Atlantic salmon. Also for freshwater nymping and dry-fly fishing where trout are leader shy. Line retainer on each spool. Cutter too!